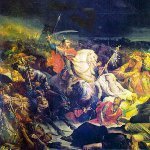 The Battle of Kulikovo was one of the most important battles in the history of Russia. The battle was fought on September 8 in 1380. This day is known in Russia as Battle of Kulikovo Day, that is annually observed on September 21. The battle took place at the Kulikovo Field near the Don River. Russian army under command of Prince Dmitri of Moscow clashed with the Golden Horde under command of Mamai. The battle was won by the Russian army and it had an important significance in the history of the state. The victory in the battle didn't end the Mongol rule over the Russian principalities, but it marked the beginning of waning of Mongol influence. This let the Russian principalities to unite and start their development as a sole country with its center in Moscow. There is a discrepancy between the historical date of the battle and the day of observance of this day in present-day Russia. This was caused by the use of two different calendars. The battle took place on September 8 according to the Julian calendar. After introduction of the Gregorian calendar the date of the battle became September 16. Later the time difference between the two calendars increased to 13 days and nowadays Battle of Kulikovo Day is observed on September 21.